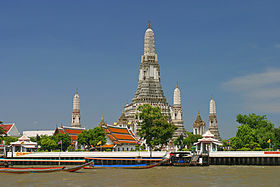 Wat Arun ("Temple of Dawn") is a Buddhist temple (wat) in Bangkok Yai district. The temple derives its name from the Hindu god Aruna, often personified as the radiations of the rising sun. Wat Arun is among the best known of Thailand's landmarks and the first light of the morning reflects off the surface of the temple with pearly iridescence. Although the temple had existed since at least the seventeenth century, its distinctive prang (spires) were built in the early nineteenth century during the reign of King Rama II. This article uses material from the Wikipedia article "Wat Arun", which is released under the Creative Commons Attribution-Share-Alike 3.0 License.